Team owner, Dietrich Mateschitz, Red Bull, labels Sebastian Vettel as unique and is quite baffled the way Vettel’s dominated the 2011 F1 season with the potential of winning the title again on Sunday at Singtel Singapore GP. He told he was wary of Vettel’s capabilities, but was surprised when it came to winning consistently for quite some time now. 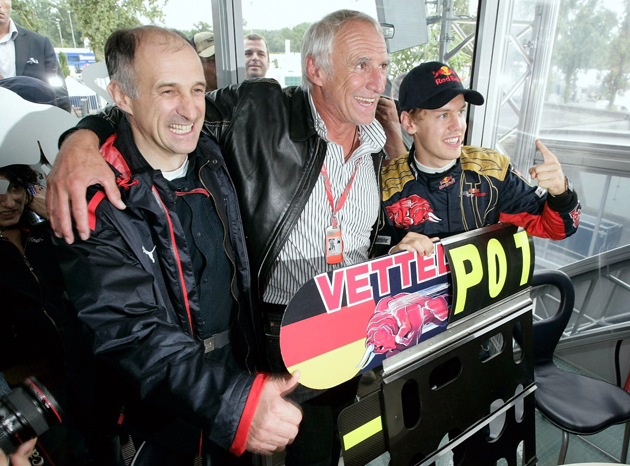 Vettel was overwhelmed and honoured when he heard the owner’s comments and told he shared a special relationship with the 67-year-old billionaire, Dietrich Mateschitz. With a 112-point lead over Ferrari’s Fernando Alonso, Vettel races in Singapore on Sunday and hopefully claim the World Championship with still 5 races remaining. The Red Bull/Vettel alliance was an instant success. Red Bull so far has won 23 GPs, 18 through Vettel and 5 through Mark Webber. Their first constructors’ title was in 2010. The 2010 season was contested closely by both Webber and Vettel, but the German eventually won the title, and this time around in 2011, has dominated races from the start and is way ahead of all the F1 drivers racing for Championship. Mateschitz attributes the success of Vettel due to the boyish charms he’s blessed with and the success rate of the team is a mixture of youthfulness, joy and sympathy. Mateschitz tells Vettel’s grateful of the association with them for 10 years, and in the process, Red Bull have delivered him a race winning car. Mateschitz respects Vettel honouring Red Bull’s efforts despite the massive talent he has and also spoke highly about Vettel’s professionalism, discipline and willpower. The low-profile billionaire’s presence in Singapore would be remote, but he believes they wouldn’t be resting on their laurels with Red Bull achieving so much this year, and expectations to soar high were more in the coming years.